F.R.C.P. - Fellow Royal College of Physician & Surgeons Glasgow U.K.
Indian Society of Organ Transplant. Member - Advisory Committee, Asian Pacific Society of Nephrology in December,1992. Gold medal and certificate of honour for distinction in physiology. Certificate of honour in ophthalmology. Dr. Peters has been accredited the Surgeon Of Excellence by Surgical Review Corporation, USA that administers Surgeon Of Excellence programs throughout the world and recognizes the surgeons and healthcare facilities that provide safe, high quality surgical care. These programs promote universal care quality, regardless of where the patients have their procedures performed. He marked his name twice in the ‘Limca book of records’ by performing ten bariatric surgeries in a day(Mar ’13) and later breaking his own record by performing the highest number of bariatric surgeries i.e. sixteen (Mar ‘14) in a day. He is associated as a teaching faculty - Visiting Professor with IRCAD (Research Institute against Digestive Cancers, a worldwide reference training centre in minimally invasive surgery in Strasbourg's University Hospital, France & Taiwan. Resource Person- The College of Surgeons of Sri Lanka in association with The Royal College of Surgeons of Edinburgh for Advanced Laparoscopic Bariatric Surgery Training. With over 19 years of surgical experience, his practice is now dedicated to Bariatric & Metabolic Surgery for diabetes, performing over 300 cases annually. He is also a DHA Certified Specialist Bariatric Surgeon in U.A.E. Neuromuscular Diseases fellowship, Vancouver, Canada. Clinical Neurophysiology fellowship, Kentucky, USA. Life Member, Association of Physicians of Indian, 1990. Life Member, Indian Society of Nephrology, 1991. Life Member, Indian Society of Organ Transplantation, 1991. Fellow, Indian Association of Clinical Medicine, 1994. Life Member, Hypertension Society of India, 1994. Life Member, Indian Medical Association, 1997. Fellow, IMA Academy of Medical Specialties in Nephrology, 1997. Fellow, Indian College of Physicians, 2001. Member (MAMS), National Academy of Medical Sciences (India) NAMS, 2003. Fellow, Indian Society of Nephrology (FISN), 2003. Obtained college scholarship on merit in 8th and 9th semester class of 3rd professional MBBS. I am amongst the first few nephrologists in India who has received a formal training to do tunneled dialysis catheter. In the last three years I have done more than 50 tunnelled dialysis catheters. I was instrumental in organizing a workshop on vascular access, the first of its kind in India in corroboration with DNS in September 2010.The workshop had excellent attendance with accolades from all those who attended. I was part of the team which carried out all combined liver-kidney transplant cases in last three years. My experience in liver transplant has helped me understand the complexities associated with this challenging field. I have been managing replacement therapies in these critical patients and am well versed with MARS as well as CRRT. I had a poster presentation in the prestigious vascular access conference at Kuala Lumpur, Malaysia titled “End of the road therapy: Vascular access in a difficult situation”. I have come up with the concept of vascular access clinic which hopefully would soon be shaping up. Under my expertise our team has been running a successful stand-alone dialysis unit in collaboration with CGHS at Sadiq Nagar CGHS dispensary. We are doing 500 dialysis in a month in three shifts daily. Our unit has been a role model for others with appraises from the government sector as well. I am also working on angioplasty and stenting of occluded AVF which I hope to develop in next 2-3 years. Surveillance of vascular access is also an area of special interest where I am pursuing research. I am part of the team which carried out the first successful ABO incompatible renal transplant at Indraprastha Apollo Hospital. I have ample experience in managing difficult situations in renal transplant. Specialization: All cases of anaesthesia except cardiac specific interest in liver and kidney transplants. Indian Society of Haemodialysis and Peritoneal Society. Awarded with best exam award at ESMO ( European society of Medical Oncology) Examination 2013 for scoring the highest marks globally. Received bursary to attend the European Federation of Immunogenetics(EFI) annual Conference, The 28th European Immunogenetics and Histocompatibility Conference, Stockholm, Sweden from 25th June to 28th June 2014 and present a posters titled ‘CDC To AHG CDC Crossmatch In Kidney Transplant Recipients: A Welcome Change’ & ‘The Effect Of A Positive CDC Crossmatch On Clinical Outcomes In Adult-To-Adult Living Donor Liver Transplantation’. Member of newly formed Pharmacovigilance Committee of Indraprastha Apollo Hospitals, the first non-governmental hospital invited to be a part of the Pharmacovigilance Programme for India (PvPI). Dr Neerav Goyal has been in his Liver Transplant / HPB program since 2002. 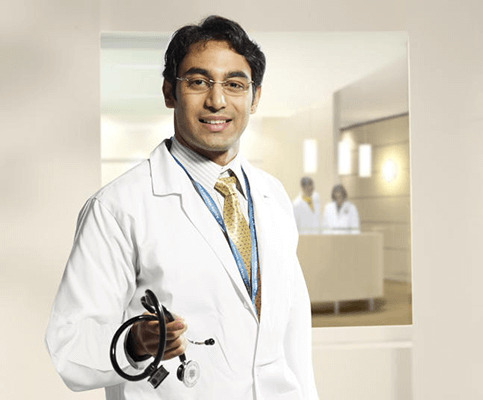 Dr Goyal is a graduate of KG Institute of Medical Sciences, Banagalore. He trained in General Surgery at St Stephens Hospital under the mentorship of Dr Prakash Khanduri. Subsequently he was Senior Resident in Surgical Gastroenterology at GB Pant Hospital , New Delhi before joining the DNB Superspecialty training program in GI Surgery & Liver Transplant at Sir Ganga Ram Hospital ( SGRH ) where he trained under Prof Samiran Nundy. Fellow ship in advance chemotherapy in haematological malignancies and Bone marrow transplant at PETER-MAC Cancer Centre, Melbourne, Australia. Member, Expert Advisory Committee on Oncology for six new upcoming AIIMS Centres, under ministry of Health and family welfare, Govt of India. Senior Consultant – Surgical Oncology for last 9 years. S.N. Medical College, Agra – Young Achiver Award . Best Paper Award in ASI Conference. Specialization: Anaesthesia and Intensive Care. Member International Liver Transplantation Society (ILTS), USA. Member Indian Society of Anesthesiologists. Indian Association of Cancer Chemotherapists. Oncology Section of Association of Surgeons of India – Member of Governing Body. Won the Dr. G. C. Pant Young Doctors award 2009 for best oral paper presentation at AROICON‐2009 on topic‐ “Daily online localization using implanted fiducial markers and its impact on planning target volume for carcinoma prostate”. 15 years post graduation experience in Surgical Oncology. Fellowship in Liver Transplant Anesthesia, University of Toronto. MEMBER NATIONAL ACADEMY OF MEDICAL SCIENCES ( Nephrology) awarded for qualification of National board of Nephrology. Past President of Delhi Nephrology Society, Past Vice President of Indian society of organ transplant. Fellow of Royal College of Physician. Worked at the John Rodchje Hospital Oxford. Royal College of Obstetricians & Gynaecologist (UK)- Continued Professional Development (CPD) Programme. Cerebrovascular Surgery Fellowship at Fujita Health University, Nagoya,Japan, July 2009. Spinal surgery fellowship (minimally invasive techniques), Hochtaunusklinik, Bad Homburg,Germany, Aug 2010.